Programming involves machine instructions working on data that is available in memory. So when you want to, say, add two numbers, then both those numbers have to be available in memory. And for that to happen, you should allocate some memory space for that. In Go, you can do that easily for most types with the initialization operator. Here Go automatically allocates some memory for the variable i - the size of the memory allocated here is that required by a single integer. Since we have also said i := 5, the integer value 5 is assigned to that memory space after the space is allocated. For variable j, no assignment has been stated. However, Go assigns a "zero-value" by default to most data types. For numeric fields, this is the value 0. So i now holds the value 5. And j now holds the default value 0. Let’s do a short example to find the ‘zero-value’ or default value for some other known data types. When there is a value stored in memory, it is stored in a physical location. This location is called its address. Many programming languages, including Go, allows you to access the data in a location by specifying its location in memory. Note that you obtain the address of a variable by using the & symbol before the variable name. Let’s see some more examples. The actual value of the address will differ from machine to machine and even on different executions of the same program as each machine could have a different memory layout and and also the location where it is allocated could be different. You could ask the question, ‘so would my program behave differently on different machines since the addressing changes?’ It is true that the addresses will change, however, normal programs do not use the numeric value of the address for anything. Instead, what they usually use is the value referenced by the address. You can get the value at an address by using the * symbol before the address. Let’s see some examples where we dereference and address to get its value. ptr := &c //address of c.
When a variable holds an address, it is called a pointer. So in the example ptr := &c, ptr is a pointer and it holds the address the of c. Putting it differently, ptr is a pointer to the variable c. You could also say that ptr is a reference to the variable c. All of these are valid, but they tend to be used in slightly different contexts. To illustrate, if we had i := 5; ptr := &i, we could roughly illustrate it as shown below. 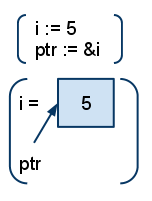 In using it, both i and *ptr refers to the integer value 5. You can only take the pointer to a variable and not to a literal value or a constant as the following examples show. Why do we need the complexity of addresses, pointers and references? Why can we not just use the actual value? One of the reasons for working with addresses is a matter of efficiency; we shall see more when we discuss pass-by-reference and pass-by-value. As a metaphor, imagine a page on Wikipedia, let’s say one about Paris: http://en.wikipedia.org/wiki/Paris. If you wanted to send that entire information to somebody, one way would be to copy the entire page into a document and send it to him, say via email or as a print out. An easier and much faster alternative would be to just send the link to the page, which is a unique url/reference to it. In this case, there are no redundant copies and both of you can read the latest page about Paris. If you sent the entire page, the former method, then it is similar to ‘pass-by-value’ - the entire value is being passed. If you sent only the link, the latter method, then it is similar to ‘pass-by-reference’ which is passing the address. Both are useful depending on what is required in a situation. When you pass by reference, there is only a single copy of the target, and therefore any changes made by one person can be seen by all. When you pass by value, there are separate copies and what is changed by one person does not affect the original. Thank you, that the perfect expression of the subject, as always. Fantastic write up. Some of the best explanations. That's the first time that I really understand what is a pointer. THANK YOU! Thanks for this post! It seems I start understanding what actually is a pointer (at last). But it would be great if someone gave a couple examples on when and how we should use pointers. And one more question: I saw somewhere in the Go code a pointer to a pointer, i.e., **a. Could someone please explain when, how and why should we use these? Thanks a lot!